CHICAGO — Peapod says that savvy shoppers are expected to flock to online grocery delivery to help during a particularly busy time of year when food is at the heart of so many celebrations. Based on prior years’ sales trends, Peapod predicts the week leading up to Dec. 25 to be its busiest week of the year. For one day traffic, Peapod expects the most popular date for pre-Thanksgiving site visits to be Sunday, Nov. 18. However, the busiest day of the entire year for Peapod site traffic is expected to be Dec. 27 as people re-stock after their Christmas celebrations and prepare for New Year’s Eve parties. It’s not just using home grocery delivery that will help busy families save time while prepping for the rush of holiday meals and entertaining. According to Peapod’s sales trends, we can tell a lot about the smart meal prep shortcuts people are using this holiday season. Cranberry Sauce: Instead of making it from scratch, holiday hosts are looking to conveniences like pre-made cranberry sauces about 2.5 times as much as loose cranberries. Stuffing: Essential to every Thanksgiving meal, Peapod sells 17.5 times more stuffing mix than stuffing bread. While a recipe from scratch can take over an hour, the box mixes are usually done in less than 15 minutes. For a speed scratch version that uses a boxed mix but still lets chefs give it their own spin, this Cornbread Stuffing with Chorizo is a happy medium that bakes for just 30 minutes. Dinner Rolls: Pre-made breads are an excellent time saver. As the fifth most searched item leading up to Thanksgiving, pre-made breads are easy to pop in the oven for a quick warm-up vs. baking from scratch. Pumpkin Pie: There’s no shame in getting a little help in the baking department either and searches for pumpkin pie are expected to spike to their highest on Nov. 17. Christmas and New Year’s Eve are no different with many customers looking to Peapod to make their seasonal preparations easy. 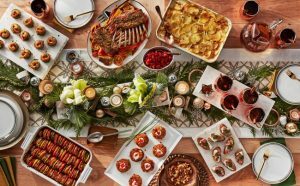 In the top five searches, frozen appetizers and hors d’oeuvres indicate a desire for some easy shortcuts to wow guests, and searches are expected to peak on Dec. 30.